Welcome to Whitney’s Inn in Jackson NH. We are a rural Country Inn that makes you feel like you’re at home. We have 27 guest rooms with 17 guest rooms in the main inn, 2 cottages and Lift Line Lodge that has our 8 Two-Room Mountainside Suites. 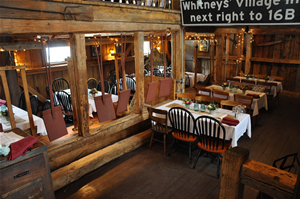 The Shovel Handle Pub is located at Whitney’s Inn for Dining, Libations and lots of fun! 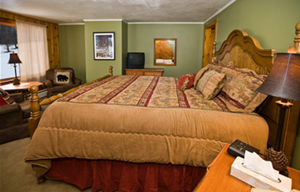 Looking for the best Jackson NH Lodging Experience, then pick the right room…. 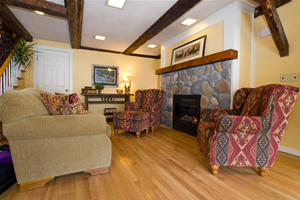 2 Bedroom Cottages have a King Bedroom, Two Twins Bedroom, and Living Room with a Double Sleep Sofa, Gas Fireplace, Mini Fridge, Microwave, Coffee Maker, Cable TV, DVD Player, Heat/AC and a Patio. *These are pet friendly ~ additonal $25/night. The 2 Bedroom Rooftop Cottage is the entire third floor of our inn. There is a Queen Bedroom, Two Twins Bedroom, Living Room with a Double Sleep Sofa, Cable TV, DVD Player, Heat/AC and a full kitchen. This is our most spacious and popular room. Reserve this fast before someone else does! 2 Room Suites have a Queen Bedroom, Living Room with Double Sleep Sofa, Gas Fireplace, Mini Fridge, Microwave, Coffee Maker, Cable TV, DVD Player, Heat/AC, Small Table with 4 Chairs and a Balcony. There are 4 upstairs Rooms and 4 Downstairs Rooms. If you are looking for Mountain Views pick the Odd Numbered Rooms! Luxury King Rooms are very spacious accommodations, with a couple chairs to sit in or a sofa. Rooms 15, 16 & 17 have a Double Sleep Sofa. Room 16 is our “Honeymoon Suite” that is very desireable! Rooms 12, 14, 15 & 16 all look out to Black Mt for Tranquil Views. Also included is Cable TV & Heat/AC. Classic Queen Rooms are our spacious Queen Rooms with either a couple chairs to sit on or a sofa. Room 19 has a Double Sleep Sofa and is pet friendly and Room 20 has Two Queen Beds and is also pet friendly. Also included is Cable TV & Heat/AC. Standard Rooms are our Ecomonical Rooms. We have one room with Two Twins and the other rooms have a Queen Bed. Also included is Cable TV & Heat/AC. The Perfect Mountainside Vacation Resort For Couples and Families. Whitney’s Inn at Jackson has been one of New Hampshire’s premier destination resorts since the 1840s, welcoming both couples and families with its charming guestrooms, superb dining in the rustic Shovel Handle Pub, its beautifully maintained grounds, and proximity to next door neighbor, Black Mountain Ski Resort. The only lodging property in the area with both downhill and cross-country skiing just outside its doors. The inn completed major renovations in 2008. All guestrooms and common areas have been newly redesigned in an Adirondack style with Hickory log, pine log, and farmhouse style furniture and décor. White Mountain artwork is seen throughout the property, displaying the beauty of New Hampshire’s wildlife and scenery. We have been receiving rave reviews and if you’re looking for a destination resort with all the amenities and a great pub with live entertainment, then Whitney’s Inn has everything you’re looking for! With two-room suites, family cottages, and romantic rooms in the main inn, we can offer lodging that meets anyone’s needs. Each morning, we provide a full country breakfast, (included in the room rate) in the Birches Dining Room, with waffles, pancakes, French toast, and farm fresh eggs. In the summer we have a 1/2 acre stocked trout pond, nearby hiking trails, and a heated pool will only enhance your experience. We attended our son an our future daughter in law wedding in august. I was surprise how beautiful the area is and the the Inn was. We had at great time and the meals for the rehersal dinner and the wedding dinner was great.. The bed was comfortable after our long travel. The pub gets my vote for food and relaxing style with music and dinner. The breakfast was just right every morning. We hosted our wedding in Mid December of 2013, and had the best weekend of our lives. The staff is amazing, the food delicious, and the inn/barn unique and such a gorgeous setting. Not one of our guests left not raving about how much fun it was and how terrific the food was!! Half Acre Trout Pond to be stocked soon! Discounted Story Land Tickets! Outdoor Heated Pool! Wrapping up Summer with a Labor Day Vacation!